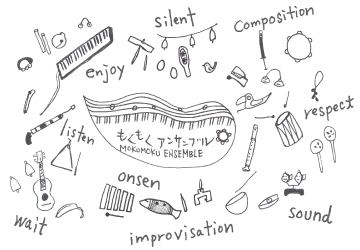 We are looking to recruit members for the “Mokumoku Ensemble” music club/ event to be held regularly once a month at the Kinosaki International Arts Center (KIAC). 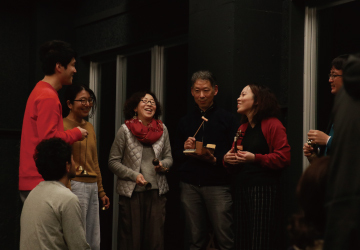 It is a music club where people who want to create music but cannot necessarily read music scores or play instruments gather under the leadership of composer and percussionist Kumiko Yabu, whose professional work is focused on creating music activities for those who are not music specialists. 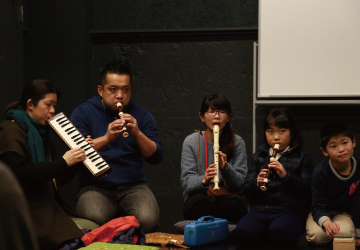 The club aims to develop its amateur membership through allowing them to work with others to create music, and uses a system for continuous, regular participation of a small group of people each time. Our goal is to garner a collective of members who wish to explore new possibilities in music together, even if they do not have any prior musical experience. 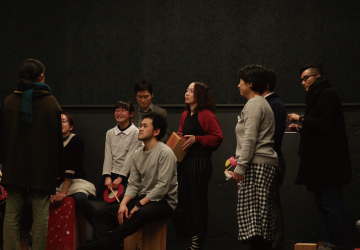 ※ The name “mokumoku” is a play on words due to meetings generally being held on Thursdays (pronounced mokuyoubi in Japanese), and them being named after the steam of the local onsen (mokumoku is a Japanese onomatopoeia for billowy smoke). ※ If you wish to tour our facilities, please consult with us beforehand. What kind of music are you particularly drawn to? What kind of music activity would you like to go to? Within the group, which role would you like to be assigned?